It’s a rule. If you plan on doing some superhero work, then you’d better be wearing a superhero costume. It’s just the way it is. That doesn’t necessarily mean that you need a full-on spandex suit and you certainly don’t need to head over to Edna Mode’s house to have her craft you a brand new suit. You just need a simple t-shirt and a bit of imagination! This Mr. 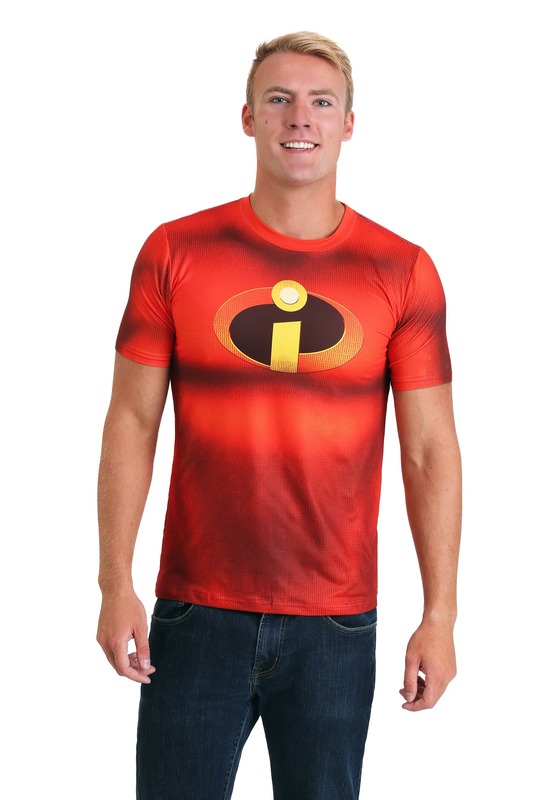 Incredible costume t-shirt comes from the Disney Pixar movie, The Incredibles 2. It’s a classic crew neck shirt with short sleeves. Made out of a spandex and polyester blend, it has a comfortable fit that has a slight stretch to it. The front has muscle shading in the front to make you look like one tough super! The chest has the Incredibles logo to top it all off. Just wear this shirt with your favorite pair of jeans and you can feel like Mr. Incredible himself. You can wear it as a quick and easy costume for your next Halloween party or you can add it to your normal rotation of everyday wear. Just make sure you pick up a face mask to help protect your secret identity.